This involves just a little duplication from my last post in terms of pictures but actually this is all about cake. 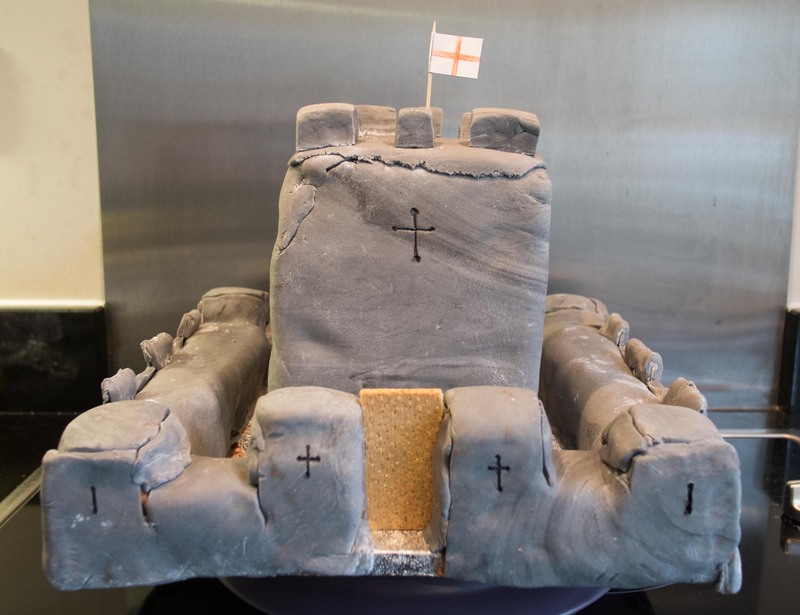 In particular, the cake the 12 year old wanted to make for his medieval castle project. It took the teachers 3 days to eat and he was copied (in terms of them making a cake) by four others in his class so it must have made quite an impression. I’m absolutely delighted he came up with this idea and did most of the work himself. He had to make a medieval castle. Apparently a motte and bailey castle was just a bit boring so it had to be a stone keep which had a central tall keep with tower and then the smaller walls round the edge. 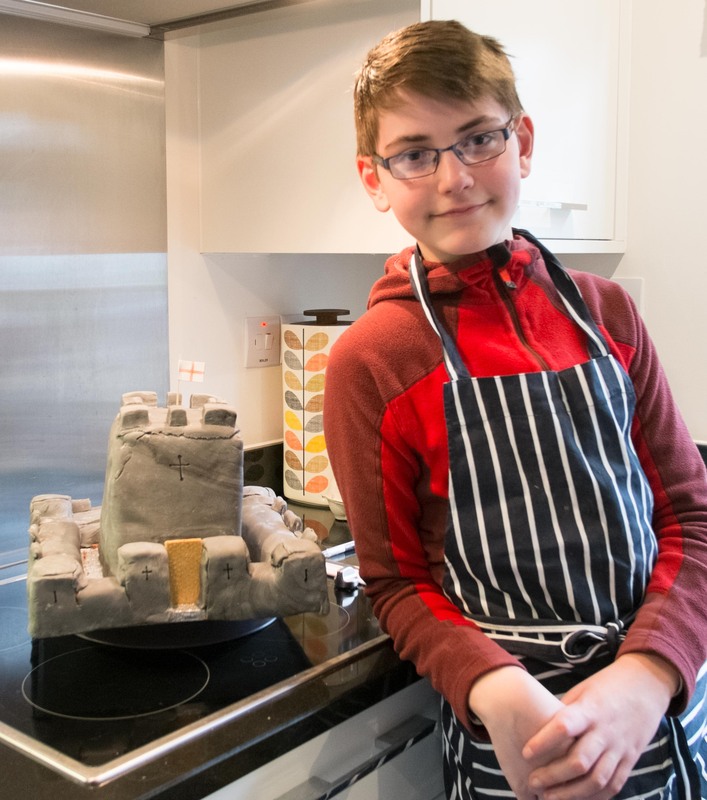 Paper mache, building out of wood, using stones, fimo, clay, nothing else would do – he enjoys baking, wanted to make a cake and worked out how to create one. A shopping list was created, we visited the local cake shop (they make lovely decorated cakes and very kindly sell various bits of icing and other decorations), the local cookery shop (as my largest cake tin was just not large enough), the supermarket and by this point we couldn’t see the work surfaces. We’ve been baking together now for a few years so for this stage, all I had to do was sit and read my book – it was great! 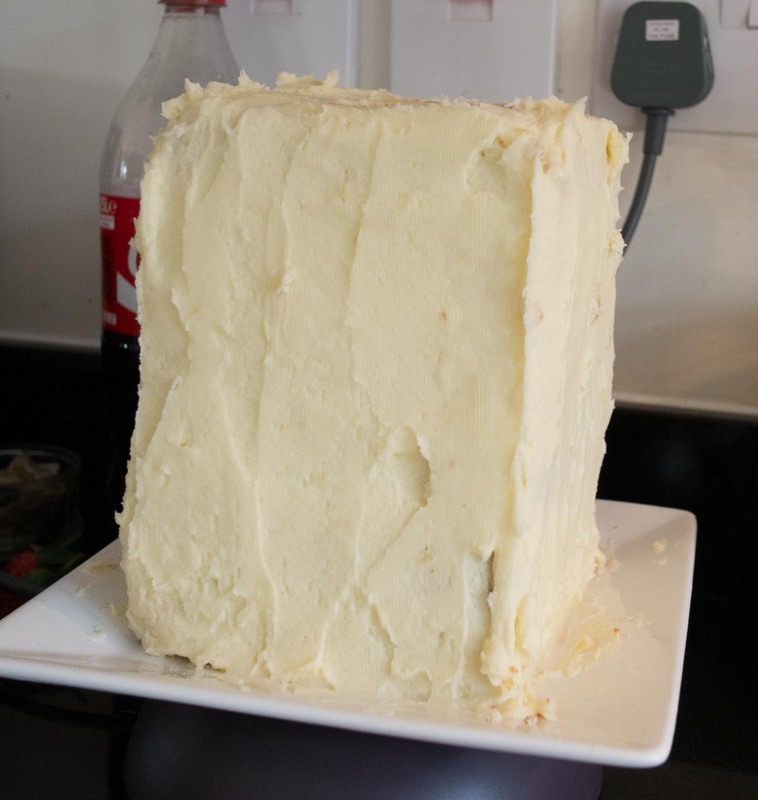 went into making a 10″ square deep vanilla sponge cake (standard victoria sponge recipe but multiplied quite a bit) and a 20×14″ or so shallow traybake chocolate cake (Mary Berry’s chocolate fudge cake cake recipe – we didn’t do the ganache), a huge amount of butter icing and of course, the fondant icing which needed to be made grey rather than white. First and foremost it was stacking 3/4 of the 10″ cake (we kept one quarter to taste just to check we were not poisoning the school) and covering with butter icing and then grey icing. I’m not hugely confident at wrapping cakes that are taller than they are wide in one sheet of fondant at the best of times, let alone when guiding someone else to do it so we wrapped the sides then stuck the top on and it worked well. Unfortunately I’ve missed a picture opportunity here. Next it was making the outside walls and small turrets which involved cutting the chocolate cake into strips, covering ourselves in chocolate butter icing and everything else. At this point, there was chocolate icing everywhere and I was not risking my camera. 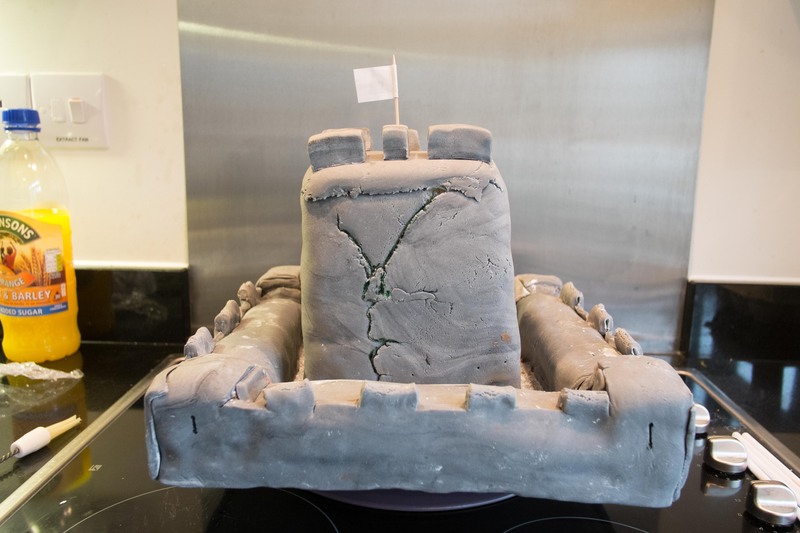 Finally that meant it was time to start the fun bits … making a flag, a biscuit door, icing turrets (you know, the uppy downy bits on a castle wall) on every possible surface and drawing windows onto the cake. 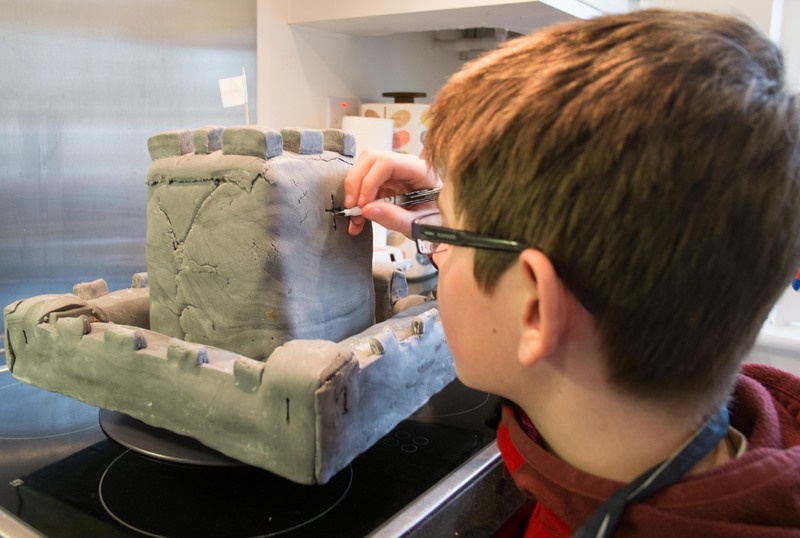 I’m particularly impressed with how he dealt with the cracks in the back from the fondant wrapping of the large cake – green food colouring and they become deliberate moss coloured cracks (it’s a medieval castle that has survived until today). Finally, after one day planning, one day to shop and make the cakes and one day to put it all together and decorate …. the Ta-Da moment.